It’s called a Weed Wrench,™ and this sturdily constructed tool is Wonder Spouse’s favorite. This is the medium-sized one. The hand pruners leaning against the Wrench are providing scale. 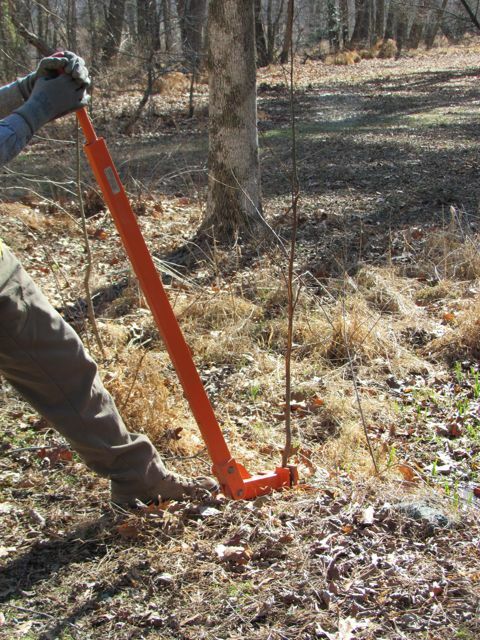 I learned about this tool at a gathering of conservationists and land managers that had convened to discuss optimal methods for removing invasive exotic plant species from their properties. One demonstration had me convinced. 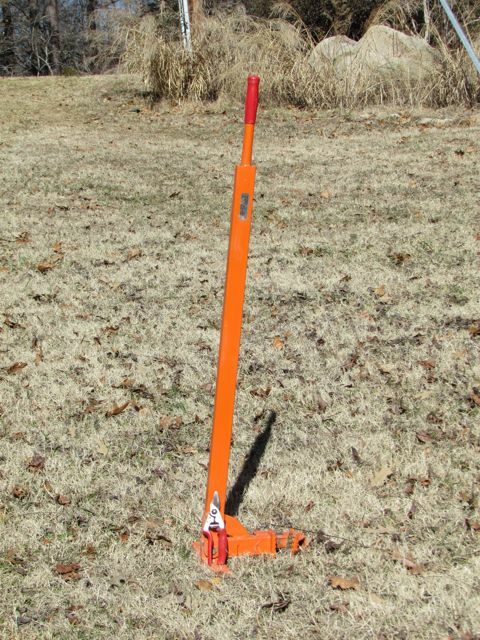 All the specifications and other details can be found at the Web site of the folks who invented and sell this tool. Click, read, learn of its niftiness. Finally, Wonder Spouse holds his trophy high. You can see that most of the roots came out in their entirety, still connected to the trunk. This greatly reduces the likelihood of resprouting. Most of the time, the entire length of the root is extracted, meaning that sapling won’t be back. 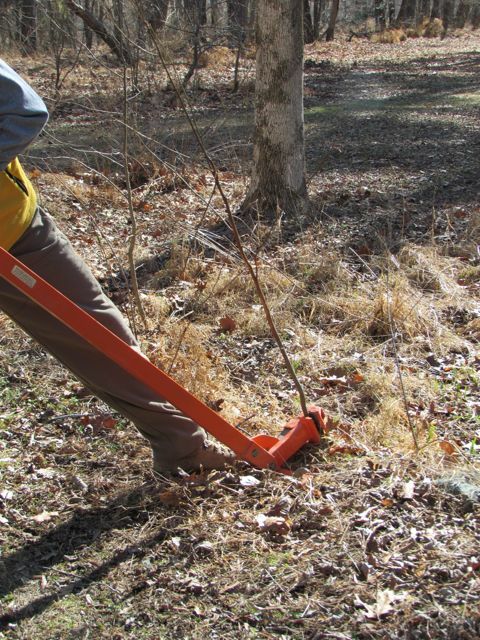 You can find somewhat similar tools in farm supply catalogs. 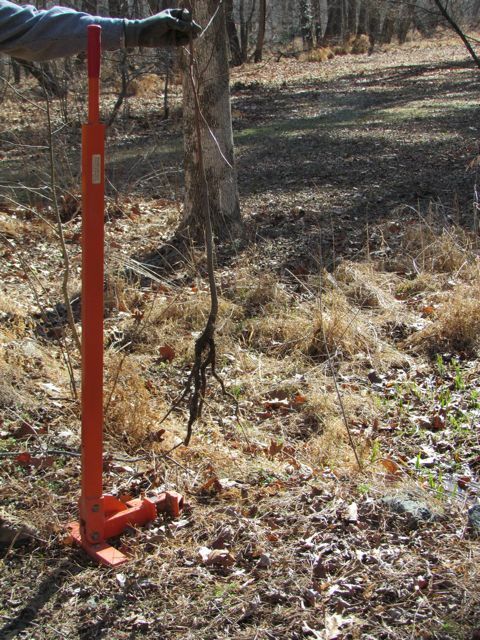 Most of them use some sort of clamp to grip the plant, and you attach the clamp via a chain to a tractor or other sturdy vehicle to pull out the plant. This seems much less efficient and potentially more damaging to the surrounding area, but situations vary, and such devices are likely suitable for some of them. We are quite happy with our tool choice. Wonder Spouse loves wandering around our five acres wrenching out invasive plants or uninvited saplings. There’s something very satisfying about popping out a troublemaker — roots and all — without ever lifting a shovel. NOTE: Apparently the gentleman who made this device decided to stop selling it, as you’ll see if you go to the link provided in this posting. Alas, I don’t know of any good equivalents for this wonderful tool. This entry was posted on February 13, 2011, 8:28 pm and is filed under Tools & Techniques. You can follow any responses to this entry through RSS 2.0. You can leave a response, or trackback from your own site.